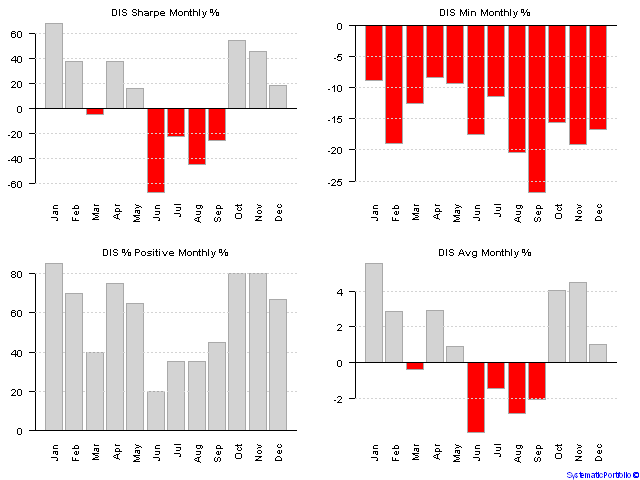 Historical Seasonality Analysis: What company in DOW 30 is likely to do well in January? Stock Market Seasonality is easy to understand, but hard to justify if you subscribe to Efficient-market hypothesis. For a good summary of seasonality, have a look at Capitalizing On Seasonal Effects article at Investopedia. Another interesting discussion was started by Douglas R Terry in his post Efficient Market Hypothesis and Seasonality that goes into detail analysis how these two ideas can co-exist. To study Seasonality, I want to introduce the new tool I developed. The Seasonality Tool is a user-friendly, point and click, application to create seasonality statistics and reports. To demonstrate the Seasonality Tool, I want to show how it can be used to evaluate an investment idea. I want find which company in DOW 30 is likely to do well in January and evaluate it using Seasonality Tool. 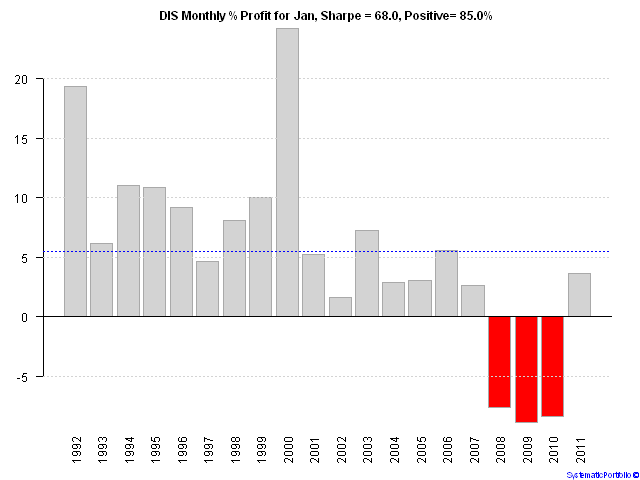 The Walt Disney Co. (DIS) was positive 17 times in January in the last 20 years. Let’s investigate the Walt Disney Co. (DIS) record using the Seasonality Tool. The Seasonality Analysis Report confirms Walt Disney Co. (DIS) outstanding track record in January. Next let’s see the details for January. The Detail Seasonality Analysis Report shows that the Walt Disney Co. (DIS) had an amazing returns in January till 2008. Following by a 3 consecutive negative Januaries which most likely indicates a change in trend (regime) for this company. So do I expect the Walt Disney Co. (DIS) be positive in the upcoming January? I’m not so sure anymore. To view the complete source code for this example, please have a look at the bt.seasonality.test() function in bt.test.r at github. This is just a quick note to wish you and your family a very healthy and happy holidays and wonderful New Year! I hope you enjoyed reading my blog and thank you for your comments and emails. Here is a short R code that implements an interesting idea from the Charting the Santa Claus Rally post by Woodshedder. 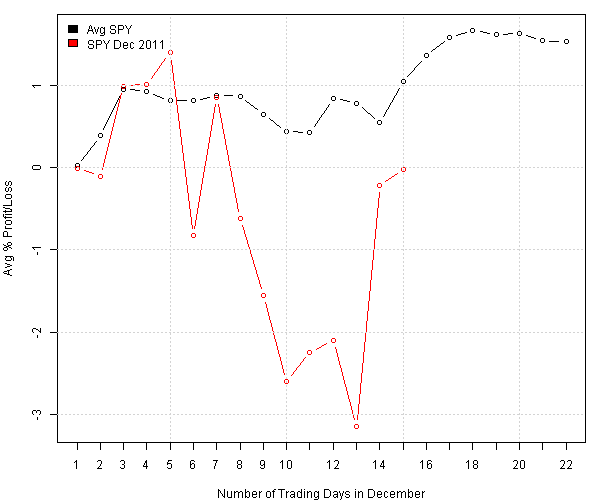 I will plot and compare the SPY performance this December versus average performance in previous Decembers. Hope this year will not disappoint and we will see the rally towards the year end. If you want to find average performance in the other months, I recommend reading Trading Calendar article by CXO Advisory. To view the complete source code for this example, please have a look at the bt.december.trading.test() function in bt.test.r at github.